Buzz Lightyear is a fictional character that first appeared in the full-length CGI animated film Toy Story by Pixar. He has also appeared in the movie Buzz Lightyear of Star Command: The Adventure Begins and the television series Buzz Lightyear of Star Command. His often repeated catchphrase is "To Infinity... and Beyond". In the theatrical films, the featured Buzz is a toy — a spaceman action figure — whereas the television properties follow the adventures of the fictional space ranger on whom the toy is modelled. His name was inspired by Apollo astronaut Buzz Aldrin. You voted for it, so here it is... "To Infinity... and Beyond!" Brilliant! The kids will love it. Thanks, Thingy. I hope the grown-ups will love it too! I'm a grown up and I love him, too! thanks. watch out for indiana jones tomorrow! I ordered some prints from your Etsy shop and I adore them! I'll be ordering again soon! Thanks a lot! Really appreciate that. How do you project the toys (toy-a-day)? I really don't know how do it. I have the blank base, but the colors... haha, I think I'll do it handmade. EXECELENTE trabajo, una gran obra, felicitaciones por su labor. Hi, EXCELLENT WORK. 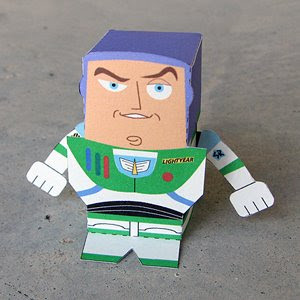 I need the PDF files of BUZZLIGHTYEAR and LOTS O HUGGIN BEAR of TOY STORY please, thank you.